Israel kept up attacks on Gaza on Tuesday, killing three Palestinians and hitting over 70 targets, including five mosques, a sports stadium and the home of the deceased Hamas military chief. 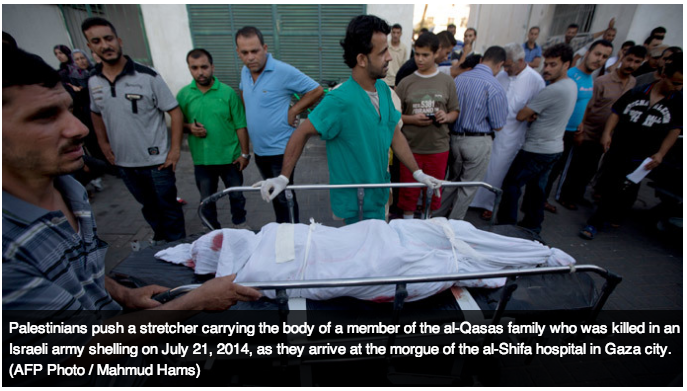 The latest casualties in the fortnight-long violence have brought the Palestinian death toll to 570, according to AP. Almost 100 of them are children and many others are civilians. Additionally, nearly 500 homes have been destroyed in the Israeli bombardments and 100,000 people have been displaced, said Jens Laerke, spokesman of the UN Office for Humanitarian Assistance (OCHA) at a Geneva news briefing. On Monday, a hospital was hit in Gaza, with four people killed and scores of others wounded in the attack. Thirty of the wounded were medics, according to Sky News. The International Committee of the Red Cross issued a statement condemning the shelling “in the strongest terms,” Reuters reports. The organization stated that the hospital came under fire at least four times, with life-saving equipment severely damaged. About 2,000 rockets have been launched over the past fortnight, Israeli military says. The country has also been destroying tunnels that Hamas reportedly constructed from Gaza into Israel to carry out attacks. Israeli military accuses Hamas militants of firing rockets from the grounds of Gaza hospitals and seeking refuge there. All in all, Israel has lost 29 people – two of them civilians, with two soldiers killed on Tuesday, as stated by the country’s militia. 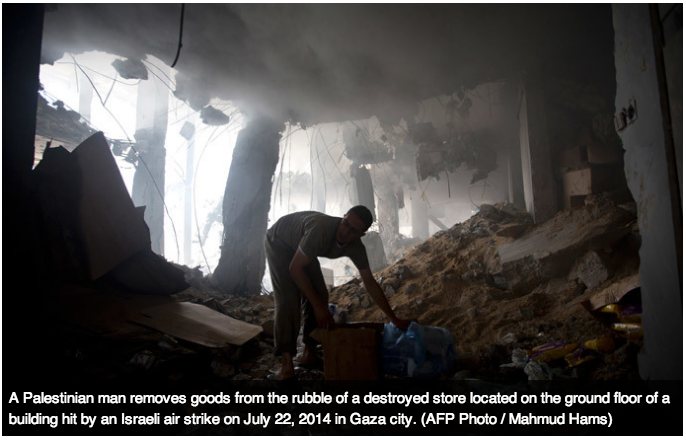 This death toll is the highest number of Israeli military deaths since the 2006 Lebanon war. Violence is raging on the West Bank as well. Medics told Reuters that soldiers shot a Palestinian man dead after cracking down on stone-throwing protesters. Tel Aviv stated that a Palestinian shot at a car and seriously wounded an Israeli in the Nablus area. This comes as US Secretary of State John Kerry arrived in Cairo on Monday for talks with UN Secretary-General Ban Ki-moon to discuss the region’s plight. The US is set to give $47 million in humanitarian aid for Gaza, Kerry said. The US is “deeply concerned about the consequences of Israel’s appropriate and legitimate effort to defend itself,” Kerry said. “But always, in any kind of conflict, there is a concern about civilians – about children, women, communities that are caught in it,” Kerry added, as quoted by Reuters. UN Secretary-General Ban Ki-moon is to fly to Israel on Tuesday for peace negotiations with the country’s premier Benjamin Netanyahu and to meet the Palestinian authorities. “Too many innocent people are dying (and) living in constant fear,” he said at news conference in Doha. 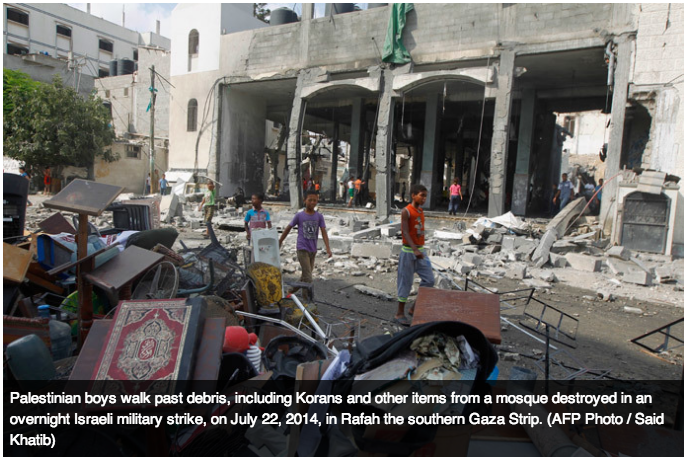 Last week, Egypt suggested a roadmap for the ceasefire which Israel accepted, but Hamas rejected. The ceasefire plan stalled after Hamas requested that Israel and Egypt lift the blockade on the coastal region that has a population of 1.8 million people. Another demand was for Israel to free a few hundred Palestinian inmates detained after the murder of three Jewish teenagers last month, Reuters reported. “The world must understand that Gaza has decided to end the blockade by its blood and its heroism,”deputy Hamas leader Ismail Haniyeh said in a televised address on Monday.